The awesome figure of St. Luke looms larger and larger out of both the New Testament and the pages of documented human history so that 2000 years after his death his image has no less been diminished by time than that of the Nazarene, Jesus Christ, whom he so nobly served. His fellow apostle St. Paul called him the 'glorious physician,' but that was only one of the many talents which this magnificent man applied in a service to God. He was a man of such monumental proportion as to make him appear incredible. His many gifts were spiced with unswerving loyalty, prolific creativity, and matchless perfection. Hailing from the ancient city of Antioch, Syria, Luke was a Roman whose early conversion to Christianity is evidenced by his membership in the Christian community of Antioch, prior to his emergence as an apostle, after meeting Paul. He had by that time developed a remarkable command of the Greek language and employed its idiomatic expressiveness in his beautiful narrative form of recording history. He became the Church's most articulate historian and wrote with such sensitivity and clarity that his Gospel in the New Testament has been rightfully called the most beautiful book ever written. Luke, a physician whose skills healed many of his suffering comrades, joined St. Paul on his second missionary journey, as recounted in the Acts of the Apostles. Their odyssey began in Troas, about 50 A.D., and took them to Philippi, Rome, Caesarea, and ultimately to the Holy Land of Jerusalem. His prominence as a physician obscured his skills as an eloquent orator in the cause of Christ, but he was later to display a considerable talent as an artist whose icon of the Virgin Mary he gave to the Mother of God herself and which is now the prized possession of the Patriarchate of Constantinople, Although his skill as a physician and his talent as an artist may have by themselves given St. Luke a small place in history, it was his consummate gift as a writer that made him one of the greatest figures in,all Christendom. Luke's contribution to the cause of Jesus Christ are beyond all measure, and his early influence on the Christian scene has enabled the Christian Church to rise to its ever increasing influence in human experience. One has only to read the Book of Acts, and his Gospel as well, to realize the stature of this most holy man; however, it is reserved to the privileged few who can comprehend classical Greek that the sheer beauty of his language can be appreciated. The praises of Luke as a writer may seem excessive, particularly since he is one of many authors represented in the New Testament, chief among whom are St. Matthew (the man), St. Mark (the lion), and St. John (the eagle). Among these, the fourth, St. Luke, suffers in comparison with the title "St. Luke" (the calf). 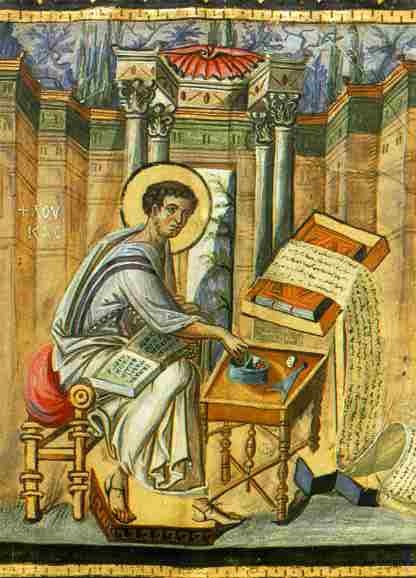 But out of the twenty-seven books comprising the New Testament, none shines with the brilliance of those composed by St, Luke. He is considered to have excelled beyond the others in expressiveness, historical method, sensitivity of narrative, and idiomatic phrasing. The patron saint of physicians and artists, St. Luke is surrounded by many legends and traditions that have not withstood the test of time. The discounted accounts of his martyrdom must now give way to the actual facts of his life. It is known that he remained a bachelor all of his life, devoting himself to the utmost degree to the cause of Christ. When advancing years curbed his campaigning, he withdrew to write his memorable accounts and died in Thebes at the age of eighty-four. An appraisal of the contributions to Christianity by St. Luke cannot be measured by the number of words he wrote, the miles he traveled in missionary journeys, or the number of years he spent in exclusive dedication to the service of Jesus Christ. St. Luke, like so many who have given so much to all of us, is not to be appraised, only to be honoured.